Edit: I was about to place an order for the AGM standard... then read this thread better and realised that doesn't have the crackle back. Oh, but the confusion of it all. Heh. That's the conclusion I've come to! The orange one is listed elsewhere with smaller (pocket size) dimensions. I've ordered both  I can always return one (or gift it). It's very tempting, this search for the elusive perfect Rider Waite, but I was already burned with the Lo Scarabeo deck. I'm not buying any more of these apparitions until I know exactly what I'm getting, no siree bob. I will post the ISBN later when I get home. O.K., I've just looked at the box of my Premium edition and can't see any ISBN number. Doing a little more research I went to www.koenigsfurt-urania.com - the domestic website - and navigated my way to their tarot catalogue. 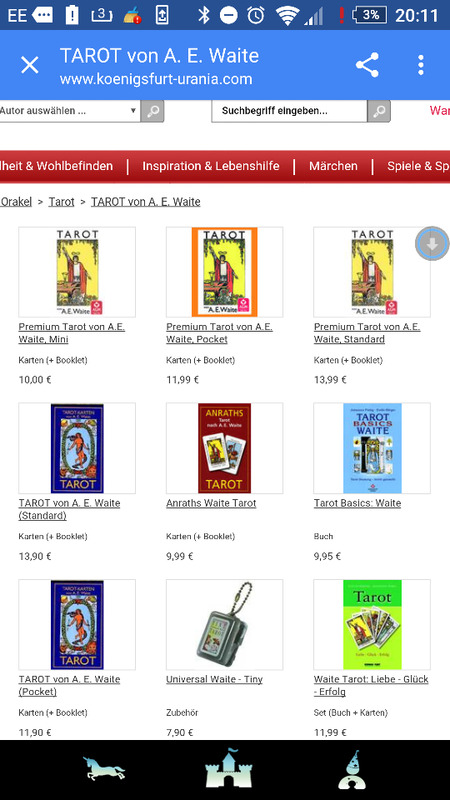 Tarotworld is their international site and there they only sell different language versions of their 'standard' deck with the rosicrucian backs. An educated guess would be the Premium decks were only made for the German market. It appears the Premium edition comes in mini, standard and pocket sizes; the boxes all have varying amounts of orange depending on the deck size; they all say 'Tarot von A.E. Waite' on the front; and they only come in German. Basically, anything else is not the deck you're looking for. If you don't want a pocket one, go for one with a white top (just make sure it's not a mini!). I finally placed an order and went for the Premium/German white box (3.2 x 1.4 x 5.1 inches, 9.9 ounces) on Amazon. If I'm thinking correctly, it's standard size and has the crackle backs. Im soo confused! So I placed another order with the same vendor for the white box, and have asked for confirmation on which is which...hopefully I'll get a reply and be able to cancel the smaller version, Fingers crossed!